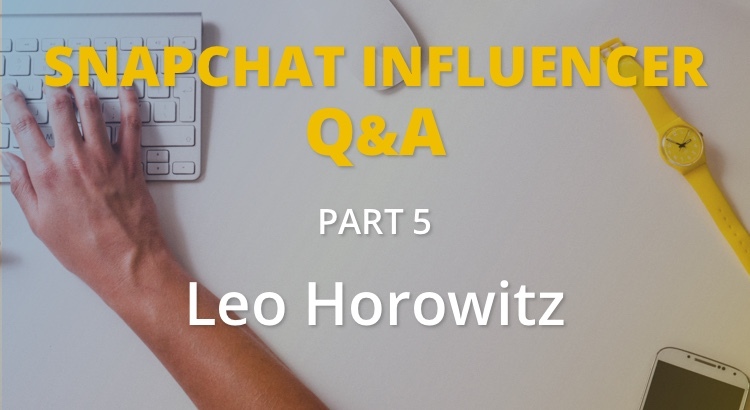 In this edition of Snapchat Influencer Q&A, we are speaking to Leo Horowitz. Leo is a young entrepreneur who is focusing on using Snapchat to inspire and motivate others. We will find out about what Leo has been doing to grow his Snapchat, plans for the future and why Snapchat is the future of marketing. Q: Hey Leo, it’s great to meet you. Could you tell us a bit more about yourself and what you do? Hey Jason, it’s great to meet you as well. I am honoured to be on your blog & thank you for your time. I am a 22 year old entrepreneur who graduated with a biology degree and is starting a life development business. My mission is to help people, show them the way & provide guidance on how they can be the best they possibly can. I plan to hit all angles including, motivation, mindset, spirituality, fitness, nutrition, lifestyle, emotions, style and more! Q: When did you first join Snapchat and when did you get serious about it? I first joined snapchat for fun when I was a junior in high school in 2011. I only just started to get serious with snapchat my last semester of college starting in January of 2016. Q: What type of content do you post on Snapchat? On Snapchat I post content that will help people see the world a different, more positive way, helping them become the best they can be. It’s about motivation, perspective, spirituality, positivity & many more topics. Q: How are you using Snapchat to grow your personal brand? I am using Snapchat to show people what I am about with the advice I give as well as lay the foundation for what my business will be based around. I told people on Snapchat that I am starting a business, but I didn’t tell them what it is yet. This keeps them guessing and intrigued trying to figure out the relevance of my snaps towards my future business plans. Q: Who are your favourite people to follow on Snapchat? I don’t follow too many celebrities or Snapchat famous accounts but I really like rap music & enjoy watching Logic’s Snapchat because he is a really down to earth, goofy & cool guy who doesn’t hold anything back and I really admire that. It’s nice to see more of who your favorite artists are as a person as opposed to just listening to their music and I love people who aren’t afraid to act weird or goofy being their true self, it’s very refreshing and encouraging. To be honest, most of my friends I follow usually post the same type of content like going out drinking, playing with animals or eating food, which is great, but I like to be different and especially like to make a difference in the world. So, watch out for my account! It’s going to get BIG very soon & change a lot of lives! Q: What do you think of the future of Snapchat as a marketing tool? I think Snapchat is the future of marketing. With Facebook being so popular amongst the younger generation I resonate with & businesses capitalising on the advertising opportunity and it being a complete success, it’s only a matter of time until snapchat operates in a similar fashion. Snapchat is used by everyone ranging from 12-30 and even some below or higher than the range listed. The more challenging part about Snapchat is can a business provide relevant material users would want to watch to see what they are offering? It can be done by a lot of businesses but I don’t think it’s for everyone. Q: Have you tried Instagram’s new stories feature? How do you think that will affect Snapchat’s growth? I have tried Instagram’s new story feature and I 1000% still prefer Snapchat, but I do like some of the additional filters Instagram has as well as the free drawing feature with Instagram has more customization. I don’t believe that Instagram’s story will affect snapchat because no one, including myself, likes to use it. I follow way too many people on Instagram to keep up with their stories. Snapchat allows you to have a more selective approach to who you want to keep up with as opposed to be potentially being bombarded by over one thousand stories. If anything, Instagram is helping Snapchat’s growth by allowing people to post messages on their Instagram stories saying “follow me on snapchat” with their Snapchat username listed. I personally have gotten a number of snapchat adds that way and so have many of my other friends. Q: How do you plan on continuing to grow your Snapchat audience? Do you have any tips for others? I plan to continue the growth of my account by continuing to spread positivity & success to all, expressing more of my unique personality, being true to who I am and working towards my strengths. I would recommend others to evaluate the purpose of their snapchats and make sure to convey your message in the simplest way possible for your audience to understand & express your personality! People love personality, especially you’re real one that’s unique to only you….because no one else is like that. Thanks Leo for taking the time to share you knowledge and opinions on Snapchat marketing. To see more from Leo, you can add him on Snapchat @leo_horowitz. If you would like to read more interviews with Snapchat Influencers, check out our blog.